Vysoké Tatry (High Tatras) is a national park in Slovakia, mostly consisting of the High Tatras mountain range. As the mountains form a natural border between Slovakia and Poland, a smaller part of the mountain range is located in Poland where it is called Tatra National Park. The region is one of the most popular places in Slovakia, with over five million people visiting each year to walk, climb, cycle or ski. There is a 600km network of hiking trails, chairlifts and cable cars, offering breathtaking views of alpine scenery. The High Tatras (Vysoké Tatry) stretch in the northern part of Slovakia bordering Poland and belong to Carpathian mountain range. The High Tatras are divided into three parts - Western, High and Belianske Tatras. The High Tatras belong to the national park (TANAP) and are also registered in UNESCO because many protected animals and plants are found in High Tatras. The High Tatras consist of peaks, mountain lakes and basins. The most notable peaks are Gerlachovský štít (2,655 m), Lomnický štít (2,633 m), Rysy (2,503 m) and Kriváň (2,494 m). Gerlachovský štít is the highest peak in Slovakia, though it is not easily accessible. Lomnický štít can be accessed by cable car. In November 2004 a severe storm destroyed a part of the forest at mid-elevation and disturbed natural fauna and flora, but most of the damage has been cleared away. The trees that used to protect the soil from erosion are gone now and the topsoil is being exposed to rain and erosion. The disaster did not have much of an impact on tourism, and all ski centres, hotels and cottages continue to operate and welcome visitors. As most towns in the region are connected to the rail network, this is one of the fastest and most convenient ways of getting into High Tatras. There are 9 express IC standard trains operating between Bratislava and Košice, the 'Tatran' ,'Kriváň', 'Gerlach', 'Rysy', 'Chopok' and another 4 untitled IC trains which all stop in Poprad-Tatry. If you're coming from Prague (Czech Republic), and want to get as much time for sightseeing as possible, consider the overnight trains. EN 'Slovakia leaves Prague in the evening (get a full day in Prague), and you can get a very cheap ticket for a sleeper booth, plus you wake up in the Tatras with the whole day in front of you. EC 'Košičan leaves Prague in the morning and comes to Poprad-Tatry in the afternoon. Both operating between Prague and Košice. There are also really cheap trains run by private company RegioJet between Prague and Košice with stop in Poprad. Tickets are 9€ for the cheapest seats and there is one train in the day and one overnight. At the Poprad-Tatry station there are direct tram services for Stary Smokovec, Strbske Pleso and Tatranska Lomnica with many stops along the way. All of those stops are within the Vysoké Tatry region. From Czech Republic and Austria, and west and east Slovakia you can use motorway 'D1', from Hungary roads of 1 class and part of motorway 'R1'. The way from Poland is a bit more complicated, with only one road connecting Zakopane and the Slovak part of the High Tatras through the border check point in Lysá Poľana. However, if you are on a hiking trip, it is possible to cross from Poland on foot at several places. For those wishing to travel from Krakow: There are many buses, every twenty minutes of so during daytime, to take you from Krakow to Zakopane on the Polish side. Journey is about 2.5 hours. In Zakopane, there are buses connecting to Stary Smokovec and Poprad. These run from out-front of the bus station where you will be dropped off. However, many only run in peak season (which, in the summer, starts from June 16). The bus company's name is Strama. You will see the signs out front of the bus depot. Check their website for exact times. Last one is about 5 p.m. There are approximately four buses daily. When these buses do not operate, simply go across the road from the bus station, and get a bus to Lysa Polana, which costs about 10 zł (takes about 20 minutes). From where you will be dropped off, cross a small bridge up 50 m and to the left and you will be in Slovakia - there is a small restaurant, gift shop, and another small shop on the border, where you can change remaining złoty for Euros, should you not yet have any. There are no ATMs. From here, there is a bus that waits at the top end of the carpark and runs through the Vsyoke Tatry to Poprad, about once every hour or two. It costs €2.2 for a single ticket. Journey time is about 30 or 40 minutes to Stary Smokovec. Poprad-Tatry Airport (IATA: TAT)  is served by Wizz Air (operating flights 4 times a week to/from London Luton) and Air Baltic (operating flights between 15 December 2015 and 12 March 2016 every Tuesday and Saturday to/from Riga, and every Tuesday to/from Warsaw). Bus number 1 connects Poprad-Tatry airport with the main bus station in Poprad . The bus is timed according to the arrival and departure times of the Wizz Air flights to/from London Luton: the bus leaves from Poprad bus station at 10:40 on Mondays, Wednesdays, Fridays and Sundays; the bus leaves from Poprad-Tatry airport at 12:40 on Mondays, Wednesdays, Fridays and Sundays. A taxi stand is available at the airport, where metered taxis are available. Alternatively, you can order a taxi in advance. It is possible to book a taxi through City Taxis Poprad  at a fixed price agreed in advance by phone or by e-mail (note that English may not be spoken). For example, (as of June 2015) a taxi (4 passengers) between the airport and Poprad town centre/Aquacity costs around 4€; a taxi between the airport and Tatranská Lomnica costs around 11€. The journey by car/taxi between Poprad-Tatry airport and Poprad town centre is around 10 minutes/5km. Transportation and orientation in High Tatras is very easy. Trains, cog railways, cable railways and trams are possibilities how to get to any locality in High Tatras. If you want to see High Tatras from a bird's eye view you can take the cable railway from Tatranská Lomnica to Lomnicky štít or take a tram and travel under the highest peaks and take delight in magnificent nature. The easiest access to the High Tatras is from Poprad or Tatranská Štrba, two main railway stations with access to the cog railways and trams leaving for the mountains. The trains running between Strbske Pleso, Poprad and Tatranska Lomnica are an inexpensive way to get around, although the schedules are not always the most convenient. Trains run mostly on an hourly basis, and unfortunately the schedules do not always overlap. Coming back to Strbske Pleso from Tatranska Lomnica can take nearly two hours on account of the schedules. For convenience sake, either rent a car or stay in Poprad as all the trains come through High Tatras towns and then onto Poprad on a regular basis. While trams are often the most convenient option, the villages and towns in the region are also connected by roads, so driving is always an option, though you might have to pay for parking. Busses also serve all the villages around the High Tatras with connections to Poprad and Zakopane. Timetables hang put at every bus stop, sorted by destination. There is a great variety of hiking and cycling trails as well. The purchase of the tourist map of High Tatras is highly recommended, as they are cheap and show a very detailed map of High Tatras with all the hiking trails marked along with the time it takes to walk them. The scale should be 1:25000. There are numerous opportunities for hiking, depending on the fitness level of the hiker, ranging from an easy stroll to difficult all day hikes. The trails are very well marked and at every junction there are signposts with the different destinations and hiking times. You can also do a cottage trek, meaning you sleep within the mountain range in mountain hut dormitories (called chata in Slovakian) and continue the next day. Prices are usually around 30€ with breakfast and dinner, but can be cheaper if you sleep in your sleeping bag in the emergency room (not always possible) and bring your own food. In high season it is highly recommended to make a reservation before, especially on weekends as capacities are limited. The High Tatras do not just offer opportunities for hiking but also for a number of other sports activities. Snow conditions during the winter are perfect for skiing or snowboarding. Funiculars are accessible to many alpine localities, such as Solisko (1840 m) or Skalnaté pleso (1751 m) where visitors can take another funicular and go to Lomnicky štít (2632 m) and see the whole of the Tatras below. In High Tatras it is possible to ski in nine localities and each one consists of two to nine slopes. Cycling is another activity that is very interesting for people who love adrenalin. Cyclists can choose either between asphalt or field roads. Different kind of roads with various level of difficulty are suitable for less or more demanding people. Skalnatá chata in Skalnatá dolina, Zamkovského chata in Mala Studena dolina, Téryho chata in Malá Studená dolina, Bilíkova chata in Hrebienok, Rainerova chata, Mountain hotel Sliezsky dom in Velická dolina, Mountain hotel at Popradské pleso, and the highest cottage Chata pod Rysmi offer accommodation to hikers on the road. Among others, these cottages are located in high altitudes above the sea level. Each cottage offers accommodation and food, but most of them offer their service only during the summer because of limited accessibility during the winter. The most attractive cottage for hikers who look for a difficult ascent Chata pod Rysmi (2250 m). This cottage was built in 1932 and was enlarged in 1977 and now offers 14 beds for €15 each. Teryho chata (2015 m) is situated in Mala Studena Dolina and is the highest cottage accessible all year round. This cottage is attractive for tourists who want to see incredible scenery either in winter or summer. The cost for one bed is €22 or emergency accommodation in your sleeping bag for €16. Sliezky Dom is the highest situated hotel in Slovakia at 1670 m above the sea level and offers 123 beds. 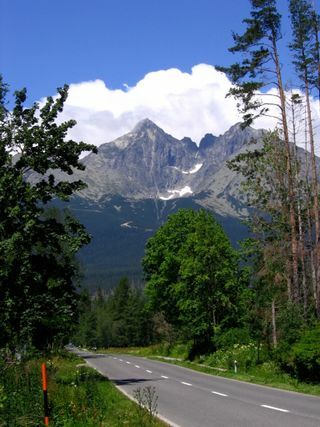 There is a wide range of hotel accommodation in the High Tatras to choose from. In general, prices are higher during the peak summer (July - August/September) and ski seasons (December - March). Prices are highest around Christmas/New Year and Easter. Prices tend to be lower outside these peak seasons; the low seasons are generally around April (excluding Easter) - June and September/October - November/December. Many hotels have special offers/packages that include breakfast (or half board) and wellness/spa treatments. It is therefore worth visiting the hotels' websites to check what special offers/packages they have if you make a booking directly with them. Pilgrimtour travel agency  (English spoken) also offers special prices/packages for a number of hotels in the High Tatras (such as Grand Hotel Kempinski). Other travel agencies providing booking services/special packages for hotels in the High Tatras include Sorger  and High Tatras Travel . The only 5-star hotel in the High Tatras is the Grand Hotel Kempinski , situated by the large galacial mountainside lake of Štrbské Pleso. The other hotels in Štrbské Pleso situated by the main lake are Hotel Solisko (4*)  and Hotel Patria (4*) . Wellness Hotel Borovica (4*) : Recently refurbished and reopened in July 2015, the hotel contains a wide range of wellness facilities, including a 20m swimming pool, a children's pool, a jacuzzi, sauna facilities (Finnish sauna, herbal saunas, infrared sauna, a tepidarium and a Turkish style steam sauna) and a fitness centre. Hotel Crocus (4*) : Apartments with kitchenette, and spa facilities (hot tub, infrared cabin, Finnish sauna and massage showers, and massage treatments) available at additional charge. Hotel Panorama Resort (4*) : Apartments and studios, with sauna facilities (Finnish, steam and infrared) available at additional charge. Hotel Fis (3*) : Hotel operated by the Tatry Mountain Resorts group. Situated by the smaller, quieter lake of Nové Štrbské pleso (around 10 mins walk from the main lake of Štrbské pleso) is Hotel Sorea Trigan (3*) , which is run by the Sorea hotel group. The hotel has a wellness world (pools, water jets, whirlpool massages, Finnish sauna, steam sauna, cooling pool, various types of massages and relaxation wraps, fitness centre). Hotel Kukučka (4*) : Recently opened in 2011, this hotel was built according to a traditional exterior architectural style, with luxurious wooden furnishings and stone wall interiors to create a homely feel. The hotel has both rooms and apartments (with kitchenettes). Wellness facilities include Finnish and steam saunas, ice bucket and bath, Kneipp bath, relaxation room and whirlpool. Grandhotel Praha (4*) : Operated by the Tatry Mountain Resorts group, this historical hotel was built in the Art Nouveau style and opened in 1905. Wellness facilities include an outdoor infinity pool with breathtaking views, whirlpools, saunas and a big indoor pool. Hotel Slovan (3*) : Hotel featuring a 'Relax Centre' with a pool with hydro massage jets, a steam sauna and a range of massage therapies, as well as pool tables, table tennis, table football and a children’s play area. Mountain Villa Slovan (3*) : Constructed according to a traditional exterior architectural style and newly opened in 2014, this villa operated by Hotel Slovan has luxurious modern apartments with kitchenettes and private wellness facilities. Wellness Mountain Cottage Ceder (3*) : Constructed in the style of a Canadian log cabin and newly opened in 2014, with rooms/suites and wellness facilities (Finnish dry sauna, steam sauna, infra sauna, indoor/outdoor jacuzzi, ice bucket). Hotel Sorea Urán (3*) : Operated by the Sorea hotel group. Wellness facilities include swimming pool, children's pool, dry and steam sauna. Grandhotel Starý Smokovec (4*) : Operated by the Tatry Mountain Resorts group, this historical hotel was built in the Art Nouveau style and opened in 1904. Wellness facilities include a swimming pool and sauna. This page was last edited on 5 January 2017, at 17:21.